Report from the High Court today where Madden & Finucane represent Derry man Steven Ramsey. Steven Ramsey claimed the powers were used to detain him in breach of his human rights. A judge found today that PSNI failures to record the grounds for searches under scrutiny were inconsistent with a code of practice. But dismissing the challenge, Lord Justice Treacy held that evidence established there had been a basis for each incident. Mr Ramsey is a former member of the 32 County Sovereignty Movement. 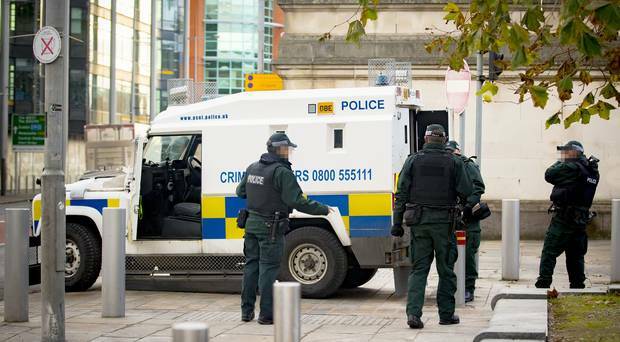 Notes from some of the searches indicated that he was stopped due to “suspected dissident republican links” or “as a result of confidential briefings”. The applicant, from Derry’s Creggan area, contested the power to detain him on the basis that it breached his privacy entitlements under Article 8 of the European Convention on Human Rights. Although the judge rejected Mr Ramsey’s original challenge in 2014, the case was remitted to him on appeal for a fresh hearing. “This practice is not in accordance with the Code,” he said. The court was told one senior officer stated: “Steven Ramsey is a know(n) dissident republican who currently associates with persons engaged in dissident terrorist activity.